The photo was taken in the backyard of our 1920s bungalow, our home of 25 years, after seven weeks of trying to call attention to building code violations - and being repeatedly ignored and misled by City officials. Besides being an invasion of privacy, we found that this building's setback was in violation, as is its size, which we calculate to be almost 100 square feet over legal limit. And now we discover that it is also in violation of Fire Access Code. It's slated to be a vacation rental property. The open balcony, aside from invading privacy, also provides no barrier to noise. 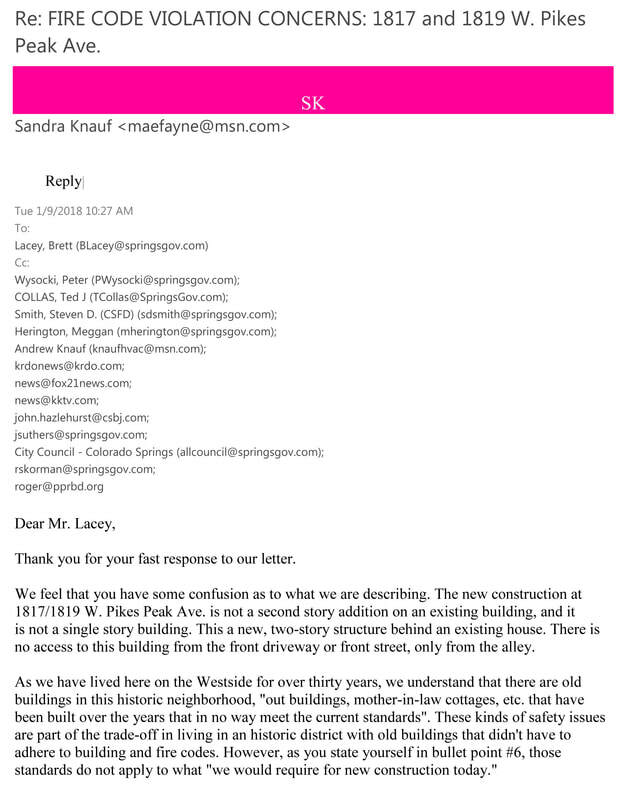 Part II Recap: After months of inaction and denial, City Planning Director Peter Wysocki finally allowed that the illegal building's permit would be "flagged"until the "finished livable square footage" was "properly resolved". At no time was the meaning of "properly resolved" explained, nor were the square footage numbers we calculated verified in writing by his office, even though we had proved what the correct measurements and setback were. Peter Wysocki went on to require the builder to deduct only 18 square feet (from an 85-square-feet illegally oversized building). 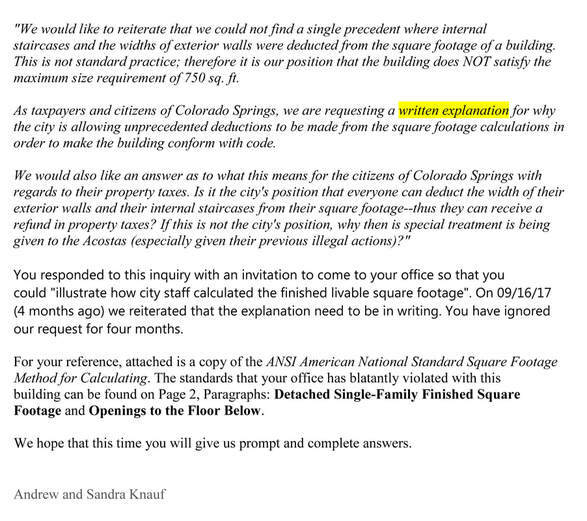 Finally, in a move that is both absurd and highly unethical, he allowed the square footage calculations on these plans to be manipulated with "new rules" to show a reduction of an additional 65 more square feet. This recalculation on paper, after the building was built, would magically bring the building "to code" in size! Through this maneuver, he not only ignored ANSI standards, he completely changed the rules on square footage calculation to help this builder. 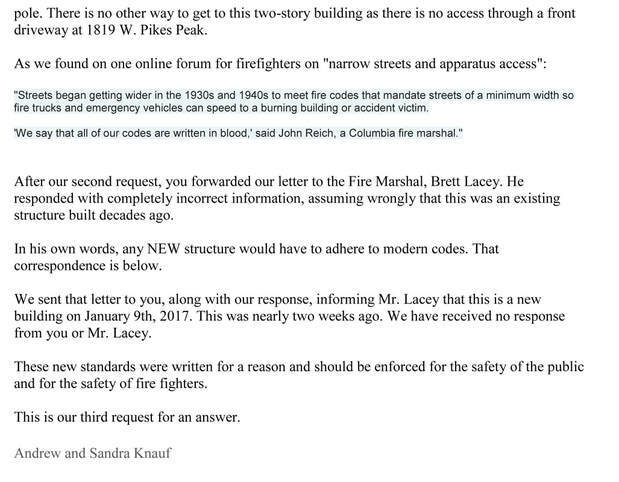 In Part III we discover that there's yet another problem that his office either did not catch (revealing great incompetence) or completely ignored (showing something far worse): An important Fire Access Code violation. 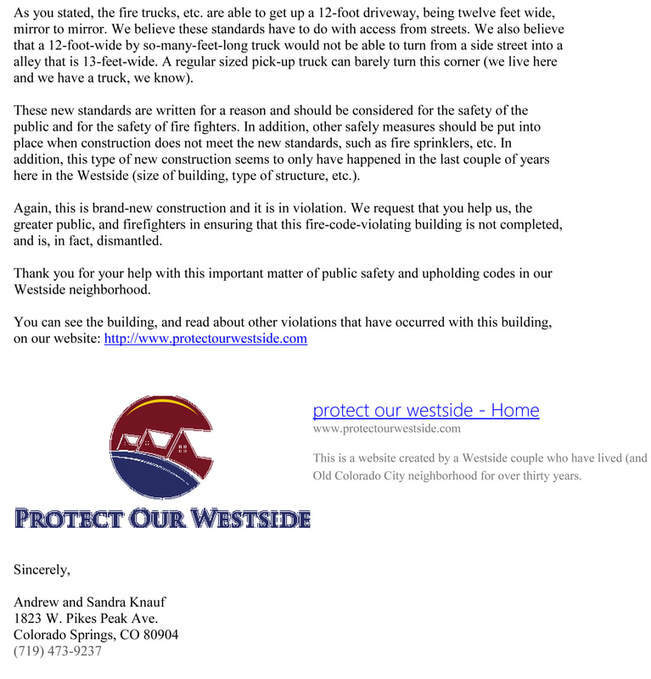 Regarding the still-illegally-sized and unethically constructed building next door to our home of twenty-five years: for some time now we have also been concerned with the issue of access of emergency equipment to this structure, which is slated to be a vacation rental and is still under construction. It has come to our attention that there is not adequate access in this alley for emergency vehicles. 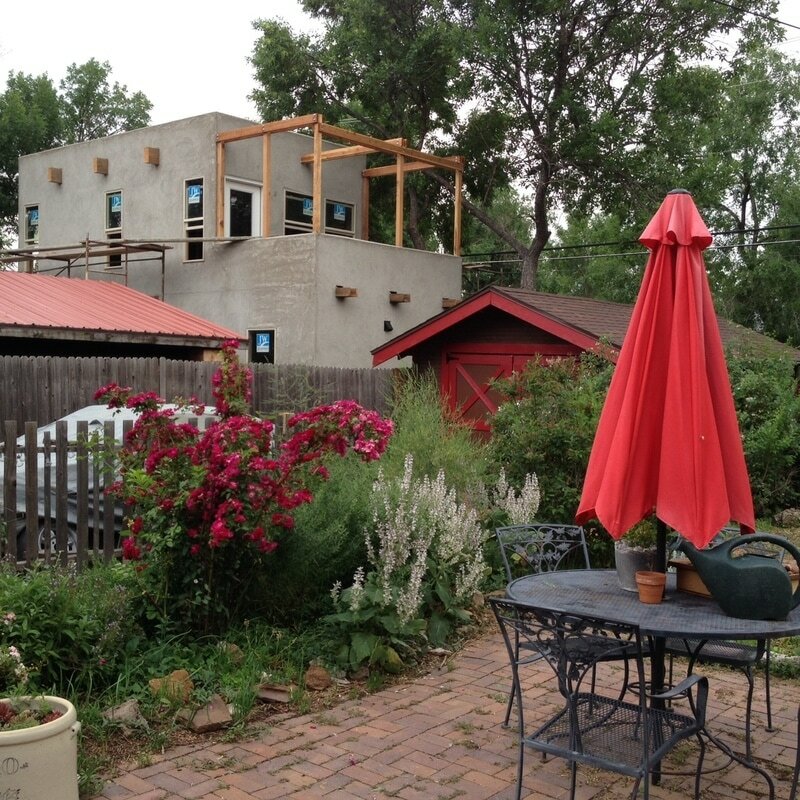 The building that you approved is abutting an alley which is 13' at the widest, between telephone poles. 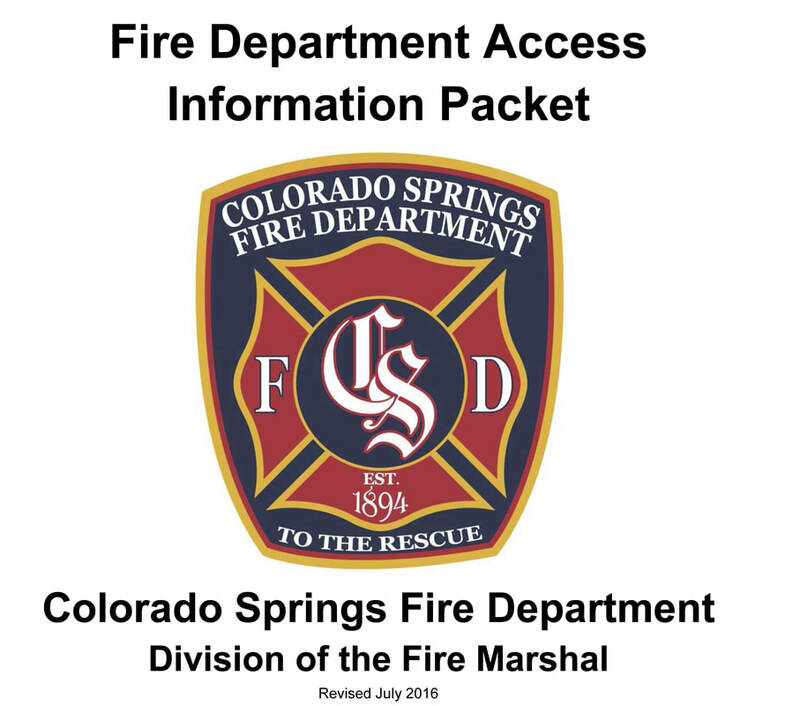 Attached is The "Fire Department Access Information Packet" from our CSFD, Revised July 2016. 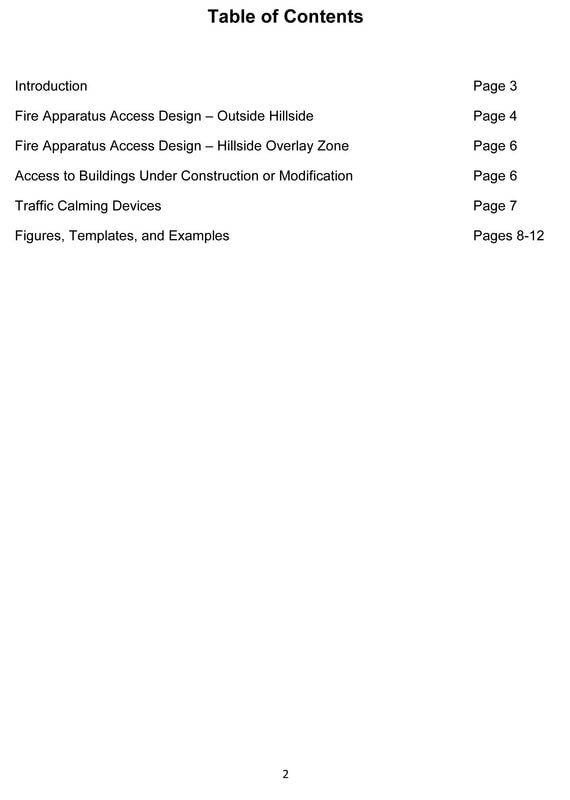 As you will find on Page 4, under "Fire Apparatus Design Access", Item #2, Public Alleys, (a) - there must be a minimum 20-foot unobstructed width. As stated above, again, this alley is 13' wide at its widest, and that is between two telephone poles, at both ends of the alley and throughout the alley. This constitutes a severe hazard in the event of a fire. 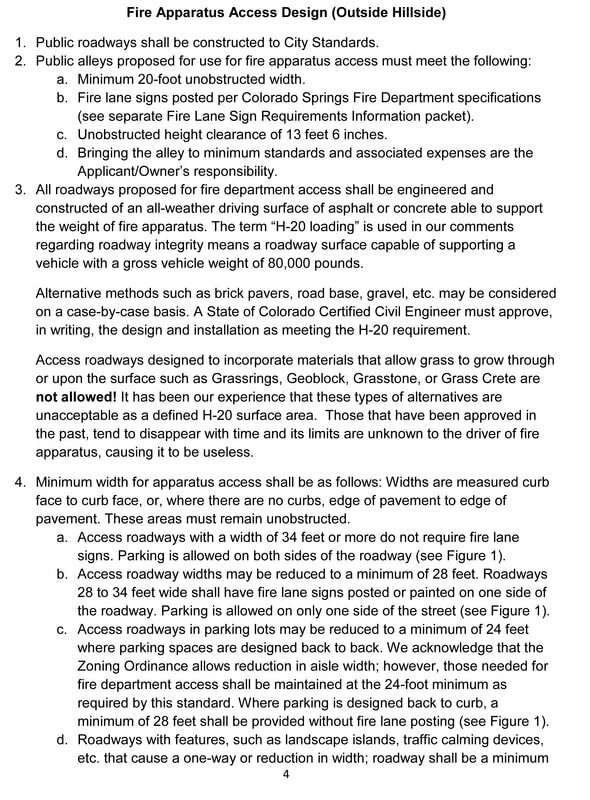 We are also concerned about #3 under "Fire Apparatus Design Access," which deals with load requirements of alley pavement. The "H-20 loading" requirement is for vehicles weighing 80,000 pounds. 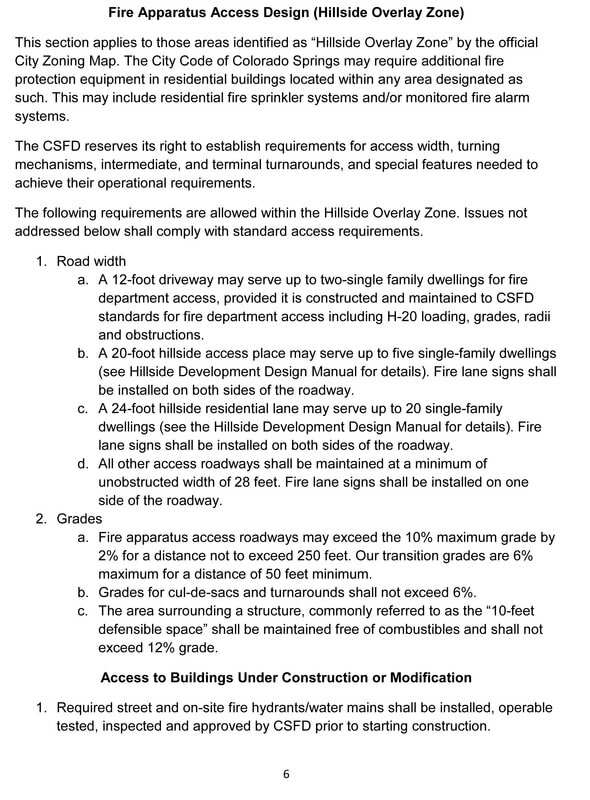 After living here for over twenty-five years, we are very concerned that this alley does not meet this requirement either. 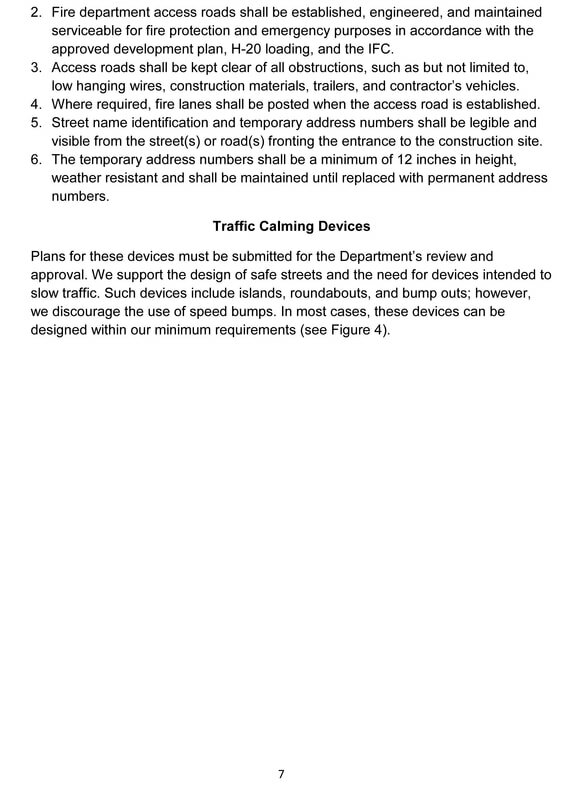 Please advise us, in writing, on what you intend to do for the safety of the people on this street in regard to this matter. ​Again we waited and heard no word. 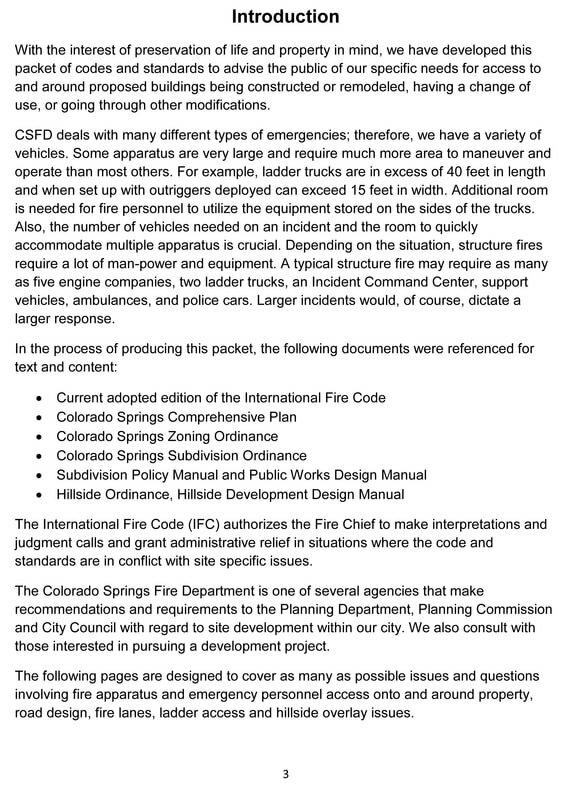 On the afternoon of January 8, 2018, we wrote a second letter requesting an answer - we also sent this letter to CSFD. 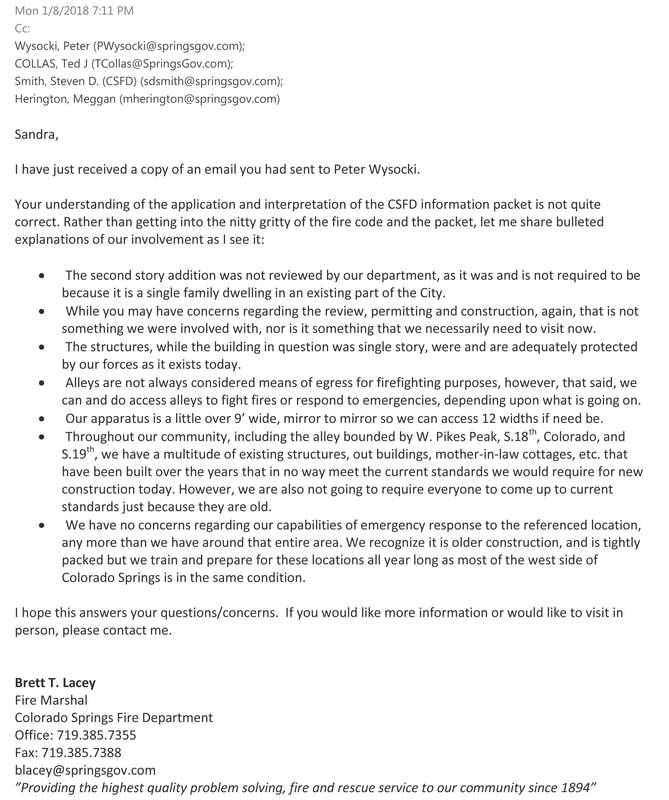 After we sent a second letter to Peter Wysocki's office (and a copy to CSFD), we received this reply at 7:11 P.M. on January 8, 2018, from Fire Marshal Brett T. Lacey. There was one mistake on our letter. The fire trucks are 9 feet wide mirror-to-mirror. That doesn't change anything. 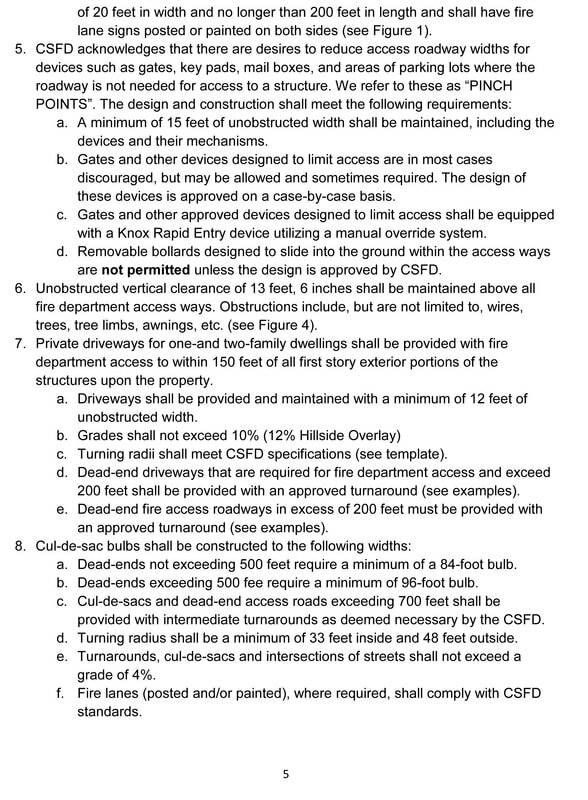 The alley requirement is still 20 feet for new buildings. Now we wait, again. No answer to our previous letter. So we send a THIRD letter on January 20th, 2018. Peter Wysocki's recalculation of livable square footage is also in violation of the International Building Code. 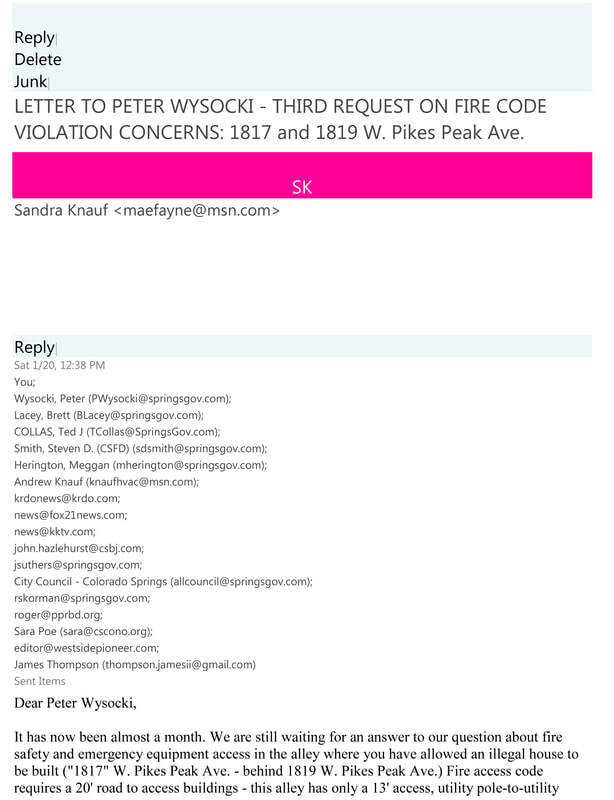 Peter Wysocki's final response was on Monday, January 22, 2018. As you can read below, he entirely skirts the fire access safety issue. In an outrageous move, he also states that his office does not have to adhere to ANSI (American National Standards Institute) codes, codes that are THE standard for measuring square footage for HUD/FHA, Realtors, title companies, VA, and Planning Departments throughout the nation. 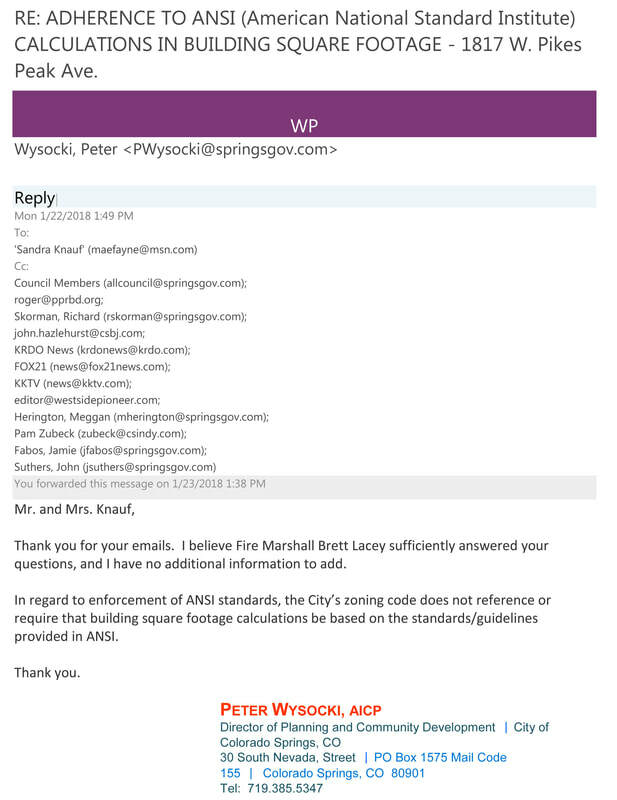 Perhaps then you could do us (and all neighborhoods) a huge favor and give Mr. Wysocki's office a call. 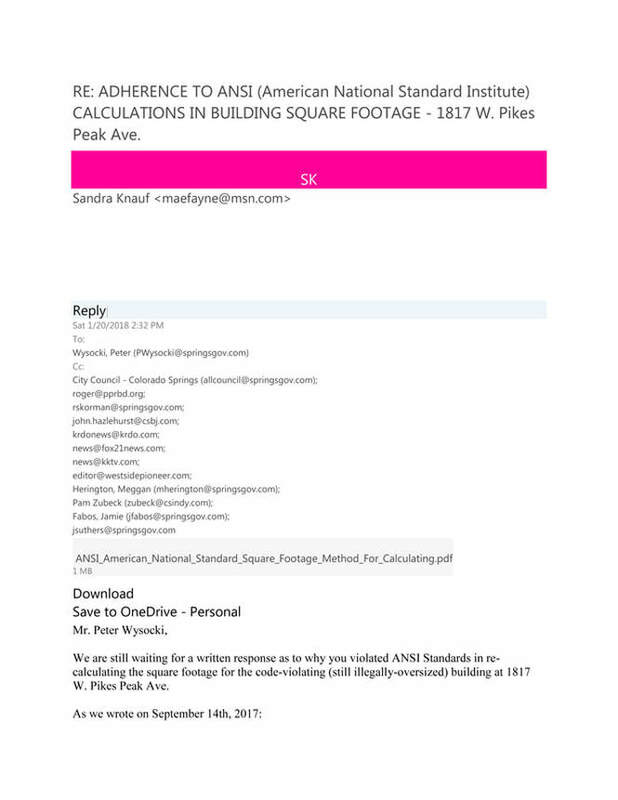 (719) 385-5347 or send him an email at PWysocki@springsgov.com to tell him what you think of the operations of his office. It'll just take a minute. This is all that it's about. Showing that we care about our community, and that we expect our City officials do their jobs. Thank you.